Cousin Greg launching 4th of July fireworks bottle rocket over one of Minnesota's 10,000 lakes. I’ve been getting a few questions on how this was done so here's the story: We did this one over a 4th of July Holiday stay at the lake and took it on a windy night with a close to full moon. A total of 3 people were involved; 1 model, 1 person to light the bottle rocket and run away, and 1 person to work the camera (me). I was using a DSLR (Sony A77) that let me set Shutter Speed, ISO and Aperture independently in Manual Mode (kind of a 'duh' for you Flickr Pro's but those were the questions I was getting). I put the camera on a tripod, attached a wide angle lens (11-16mm) and had a remote shutter release cable attached so I could take a picture without touching the camera and potentially shaking and blurring the image. We shot off a test bottle rocket and counted (one one thousand, two one thousand . . ) how long it took from lighting the fuse, till it flew and exploded – the total time was 5 seconds – so that is what I set my camera Shutter Speed. We launched some more test rockets off and worked at adjusting the launch angle against the wind trying to get in the entire arch and explosion into the picture (easier to do with the wide angle lens). I also took a couple of test pictures and played with Aperture and ISO settings and checking how those effected the exposure (shutter was set to 5 seconds). I settled on an Aperture of f/5 because it seemed to get everything around the launch area and model in focus, and used the lowest ISO I could 400 and still keep everything relatively exposed well although a little on the dark side. My camera has a live view that makes combining it all pretty easy. 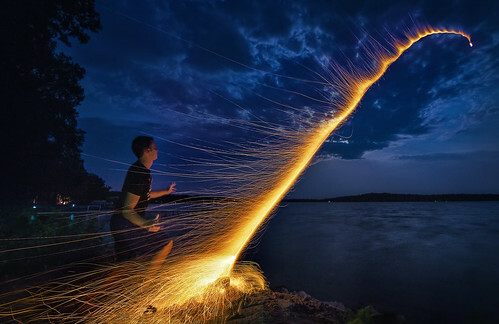 I positioned the model on the other side of the rocket from the camera so he would be illuminated by the sparks and had him hold his arms out a little because it looked liked a floating face with his hands down. It was very dark out so I shined a flashlight on the model to set the camera's Auto Focus and then I switched the camera to manual focus so it would not hunt for focus during the shot. Time to take the picture: I had the model freeze and try not to move for the entire 5 second exposure. My helper lit the bottle rocket and as soon as he got out of the way, I pressed the remote camera shutter, the rocket took off and exploded and my shutter clicked shut. We did it in one take and then ran out of there cuz the mosquitoes were eating us alive. On the computer in Photoshop; I cropped the picture, adjusted the colors and saturation a little, used a program called Noiseware Pro to reduce noise, used a program call Topaz Adjust to make the red orange sparks ‘pop’ a little and then gave the entire image a little overall sharpening. That's it – thanks for looking.